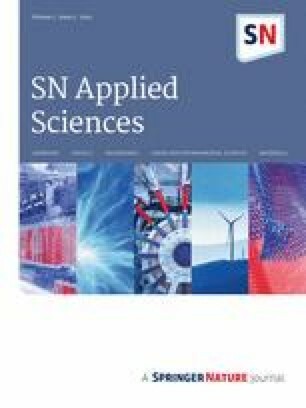 In this study, corrosiveness and scaling potential of groundwater in the Thanjavur district are evaluated based on the chemical analyses of 34 groundwater samples and GIS-based geostatistical mapping techniques. Total dissolved solid values show that six out of 34 samples exceeded the WHO drinking water standard 1000 mg/L. 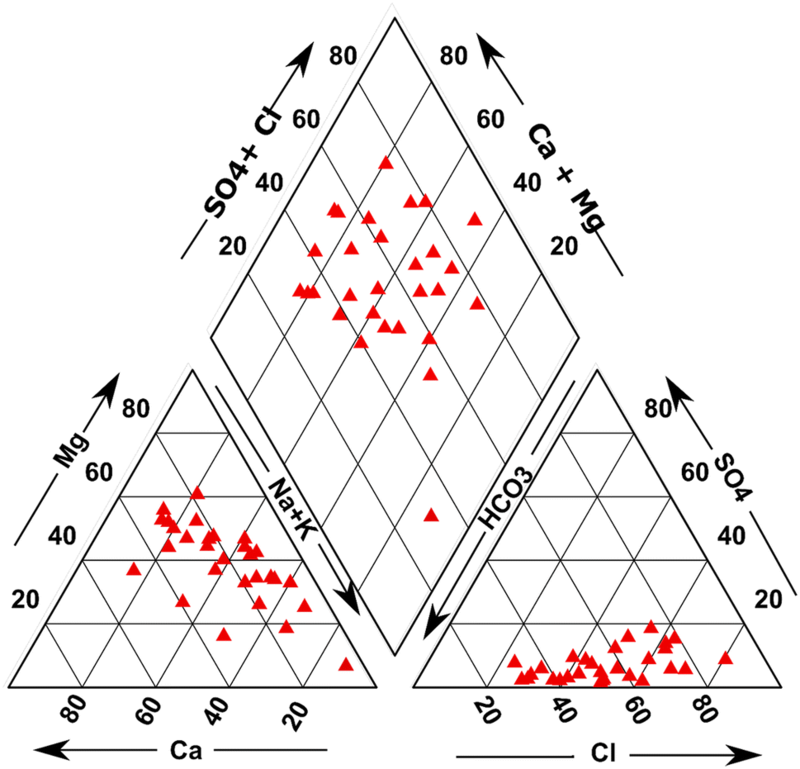 Piper plot shows that majority of the samples are mixed Ca–Mg–Cl type, Ca–HCO3 type and Na–Cl. The results of the physicochemical parameters were used to calculate the most popular corrosion and scaling indices such as Langelier index (LI), aggressive index (AI), Ryznar index (RI), Puckorius index (PI) and Larson–Skold index (LS). Results of LI show that 41% samples have corroding tendency (LI < 0) and 59% of the samples have scaling tendency (LI > 0). AI has the same result as 41% of the water is moderately corrosive and the remaining has scaling tendency. RI suggests that 88% of the samples have corrosive tendency and 12% have rigorous corrosive tendency. Values of the PI suggest that all the samples were corrosive. Finally, the LS values show that 62% of the samples have scaling tendency and the remaining have corrosion tendency. In general, groundwater in the Thanjavur district shows both corrosive and scaling tendencies, which can cause severe damage to the machineries in the industries. Spatial variation of the corrosive and scaling indices suggests that the central region of the district has more corrosive tendencies and the western and eastern regions have more scaling tendencies. Water is one of the most important environmental resources that has influences on every sector of life. It has an incredibly unique capacity to dissolve/carry almost everything—physical, chemical and biological components. Thus, the quality or the characteristics of the water in different locations vary considerably . Water quality is an important parameter for the ecosystem health, for both healthy living and on economical ways. Water is mainly used for drinking, domestic, recreational, irrigation and industrial purposes. There are certain standard values recommended by the international and national organizations. World Health Organization is the pioneering organization in this category. The water we used today may be either derived from surface water, groundwater, snow melt, rainfall, etc., Among these sources, groundwater is one of the popular resources because of its availability in the premises of use, superior quality and cost-effective extraction methods. The significance of groundwater is increasing day by day and has reached the maximum extent for the past decades. When the ionic constituents were increasing than the allowable limit, it causes health impacts in the living organisms, affects the production in agricultural sectors and increases the maintenance and production in the industries. Groundwater quality is largely controlled by geological formations by their interaction, and pollution from the manmade activities . Among the anthropogenic activities, excessive use of agricultural fertilizers and industrial wastes are the major sources of pollution. Water quality for the industries is also equally important as they are playing significant role in the economic development of the country. The significance of the industrial water quality is not often recognized either due to ignorance or by inadequate testing facility in small and medium industries. Groundwater acts as one of the important sources of water supply for industries. The most common water quality problem encountered is corrosion of the metallic parts of the machinery such as plumping systems, heat exchangers, coil pipeline and many others. Kalyani et al. reported that most of the corrosion-related issues in the industry may be due to groundwater and that major water quality parameters causing this are pH, alkalinity, total dissolved solids (TDS), dissolved oxygen (DO), total hardness (TH), electrical conductivity (EC), temperature (T). The other problem is the scaling of CaCO3 in the pipe network and other parts of the machines due to the deposition of excess carbonates. Corrosion and scaling are the most commonly found water quality issues in the industries. Both these processes are caused by several reasons, and there are different evaluation methods available in the literature. The most frequently used methods for determining the extent of these two processes are Langelier saturation index (LI), Ryznar index (RI), aggressive index (AI), Puckorius index (PI) and Larson–Skold index (LS). These methods are used by many researchers in the different parts of the world [3, 4, 5, 6, 7]. Application of geographical information systems (GIS) provides spatial mapping, which gained immense popularity among the other data interpretation techniques. Its application in water resources becomes inevitable, and several researchers are using this method extensively in their studies [8, 9, 10, 11, 12, 13, 14, 15, 16, 17, 18, 19]. It is important to have a proper measurement of water quality for the industrial purposes to avoid unnecessary expenses and working hours. In this study, we have used the five indices such as LI, RI, AI, PI and LS in combination with spatial variation mapping using geostatistical methods in the Thanjavur district in Tamil Nadu. The Thanjavur district is located between latitudes 10°48′N–11°12′N and longitudes 78°48′E–79°38′E and has a total geographic area of (3396.57 km2)https://thanjavur.nic.in/about-district/ (see Fig. 1) . This deltaic region is a part of the great Cauvery River basin and Vennar and Vettar sub-basins. Thanjavur district is the largest producer of the rice for the state and popularly known as the rice bowl of Tamil Nadu. The region is receiving both southwest (June to September) and northeast monsoons (October to January), in which latter one is more prominent . Thanjavur is having tropical semiarid climate with long summer period, and in the month of May, the average temperature reaches 36–40 °C . Alluvial and tertiary formations occur in the large part of the study area. 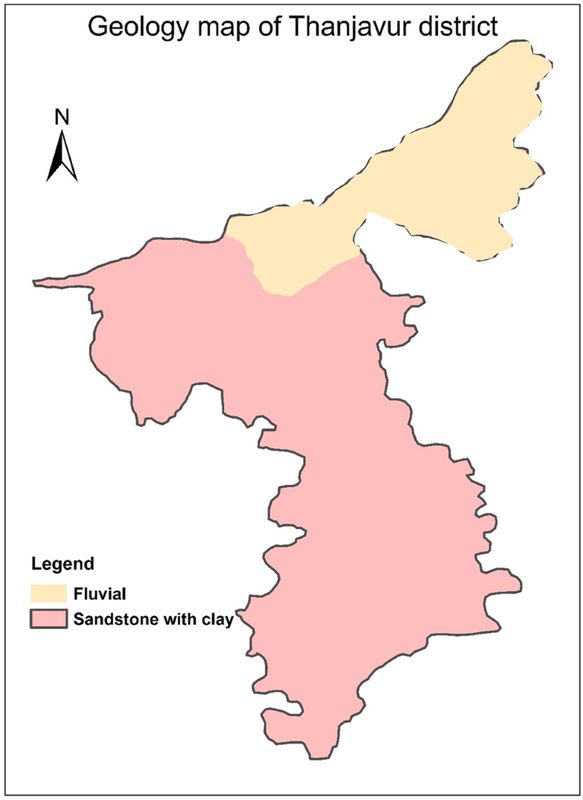 The costal regions are marked with tertiary Cuddalore sand stone (Fig. 2). A thick deposit of laterite containing impure limestones, sandstone of clay calcareous, silt and argillaceous verities is seen in the west and southwest regions. Geomorphologically, flood plain, delta plains, natural levees and sedimentary high ground are present in the district. The northern area predominantly consists of flood plains, and sedimentary high grounds range between 60 and 80 m.
So the number of good yielding wells in northern regions is more, when compared to the southern region. However, we have taken samples from all over the study area, according to the availability of wells. This will be helpful in representing the total hydrogeochemical conditions of the region. The most common land use pattern is agricultural lands and human settlements. Groundwater occurs in six different aquifers, namely Archean, Cretaceous, Eocene, Miocene, Pliocene and Quaternary. In Archean aquifers, groundwater occurrence is limited to weathered and fractured rocks in both confined and unconfined conditions. In cretaceous aquifers, coarse gravel bound by clay with sand forming the aquifer material is mostly unconfined in nature. Eocene aquifers, having a thickness around 80 m, are made up of sand, silt and clay with confined conditions. Miocene, Pliocene and Quaternary aquifers are mainly formed by sandstone, gravel with clay and limestone. A total of 34 groundwater samples were collected and analyzed from the Thanjavur district. Pre-cleaned polythene bottles (500 mL) were used to collect samples which were then stored under laboratory conditions at 4 °C until analysis. Complete chemical analysis was carried out with reference to the methods suggested by APHA . EDTA titration was used in analyzing major ions such as chlorides (Cl), bicarbonates (HCO3−), magnesium (Mg) and calcium (Ca). Further, pH and electrical conductivity (EC) were examined using a field kit. A flame photometer was used in analyzing sodium (Na) and potassium (K). Sulfates were estimated by an UV–visible spectrophotometer. Finally, fluoride concentration was analyzed by applying SPADNS method. The spatial variation mapping of the water quality parameters is done by the software package Surfer 9. 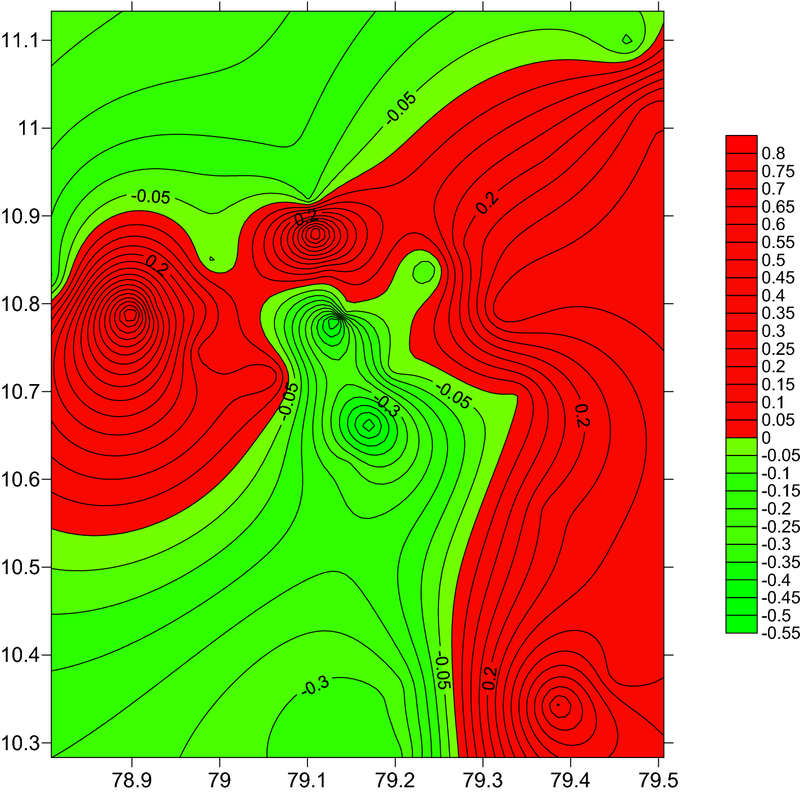 We have used the kriging-based interpolation technique for the mapping, which can generate continuous surface for the unknown data points by spatial autocorrelation. The values of unknown points were determined from the surrounding known points. 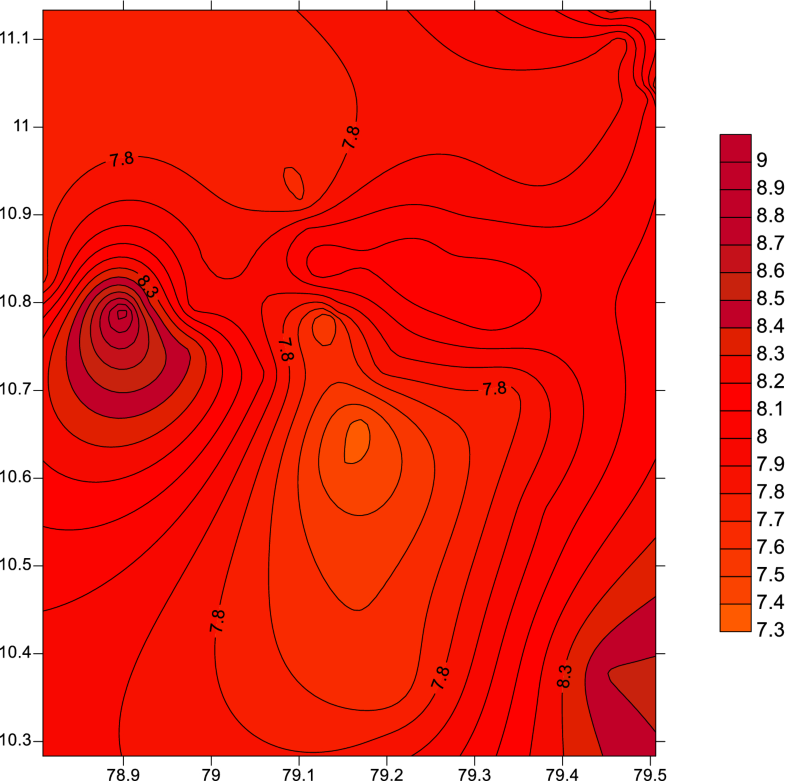 Kriging is one of the best interpolation methods based on the assumption that the neighboring samples will have similar values, compared to those located farther away. The verification is done by an empirical semivariogram. The best fit is identified by the line that represents points in empirical semivariogram cloud graph, which appraises the spatial autocorrelation. 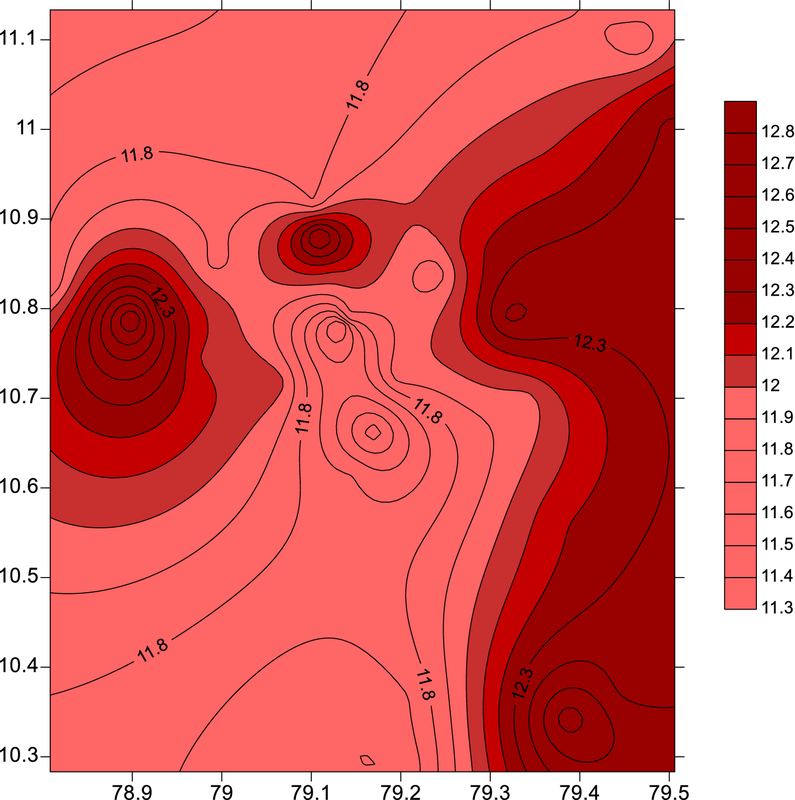 With consideration to spatial autocorrelation between predicted and measured locations, the kriging weights that are assigned to different measured parameters are obtained. Table 1 shows a detailed explanation about calculating the indices and its interpretation. The results of the groundwater quality parameters of Thanjavur district are presented in Table 2. The range of pH in the study are was 7.7–8.5; mostly, the water was alkaline and well within the advised optimum range suggested value 6.5–8.5 for the drinking water by WHO . Electrical conductivity (EC) is recorded to be maximum of 5300 μS/cm, and the average value was 1172 μS/cm. EC is an indicator of the total dissolved constituents in the groundwater. The TDS level in drinking water is considered to be good when it is less than 600 mg/L, and if it exceeded 1000 mg/L, it will affect the taste and water becomes unpleasant ; in this study, out of 36 samples, six samples exceed this limit. The foremost cation in the study area is sodium, with a concentration varying between 12 and 665 mg/L. There are no health-based guidelines proposed by WHO; however, concentration exceeding 200 mg/L will have bad taste to the drinking water . Next to sodium, Ca2+ was found as second dominant cation which ranged from 18 to 112 mg/L. As per WHO standards, the permissible limit of Mg in drinking water is 12 mg/L . 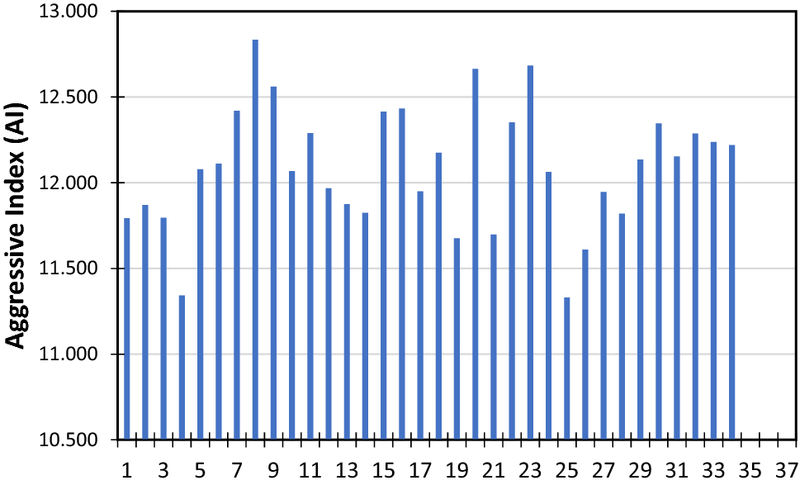 The average concentration of Mg shows that the concentration exceeded the above-mentioned standard values. Calcium and magnesium in the groundwaters of hard rock regions are derived mostly from the minerals such as pyroxenes and amphiboles in the silicate rocks . Thus, mineral weathering is the important source for these ions in groundwater. Additionally, dissolution of dolomite and calcites is the other origins of these ions. In some regions in the study area, Na dominates over Ca, showing the presence of inverse cation exchange process, in which Na from the aquifer is replaced by Ca from the groundwater. The most common origin of K in groundwater is the dissolution of potash feldspars and clay minerals in the aquifer. Chloride represents the most dominant anion in the study area with a concentration between 28 and 1517 mg/L. The natural origin for Cl is not much reported in the literature except some cases of dry deposition and the dissolution of halite minerals. In this area, the major source of chloride can be attributed to anthropogenic influences like domestic sewage and fertilizer use in agricultural fields. In normal circumstances, if there is a common origin of Na–Cl (common salt), there will be proportion occurring between these ions. However, there is a deficiency of Na in a few regions which is an indication of direct ion exchange. Bicarbonate is the second dominant anion in the groundwater of the study area, which is mainly originated by the dissolution of carbonates. The average concentration of HCO3 is 266 mg/L, and there are no standard values for drinking purposes. Carbonate concentration ranged from 0 to 60 mg/L. There is not much significant concentration of carbonate observed in the study area. Sulfate concentration is high in certain locations. High values of SO4 along with Ca suggest a possible dissolution of gypsum. Like chloride, nitrate is also not commonly observed in the nature. On the other hand, its origin mainly attributed to agricultural activities like excess application of inorganic nitrogenous fertilizers and manures and wastewater disposal and oxidation of nitrogenous waste products in human and animal excreta, including septic tanks leaching from natural vegetation . The permissible limit of NO3 in drinking water is 50 mg/L . Excessive intake of nitrate may cause a blood disorder, namely methaemoglobinaemia, in which abnormal amount of methemoglobin is produced, preventing oxygen distribution in the body . In this study, all the samples were under the permissible limits. Fluoride is a minor anion originating and mainly sourced from geologic formations enriched in minerals such as fluorite and apatite [25, 26, 27]. The permissible limit of F in drinking water is 1.5 mg/L . Though an optimum level (0.6–1.2 mg/L) is beneficial for the dental and skeletal health, a concentration beyond 1.5 may impart a disease called fluorosis [22, 28]. Only one sample in the study exceeded this permissible limit. Hydrochemical evolution and grouping of groundwater can be evaluated using the graphical methods such as Piper diagram . 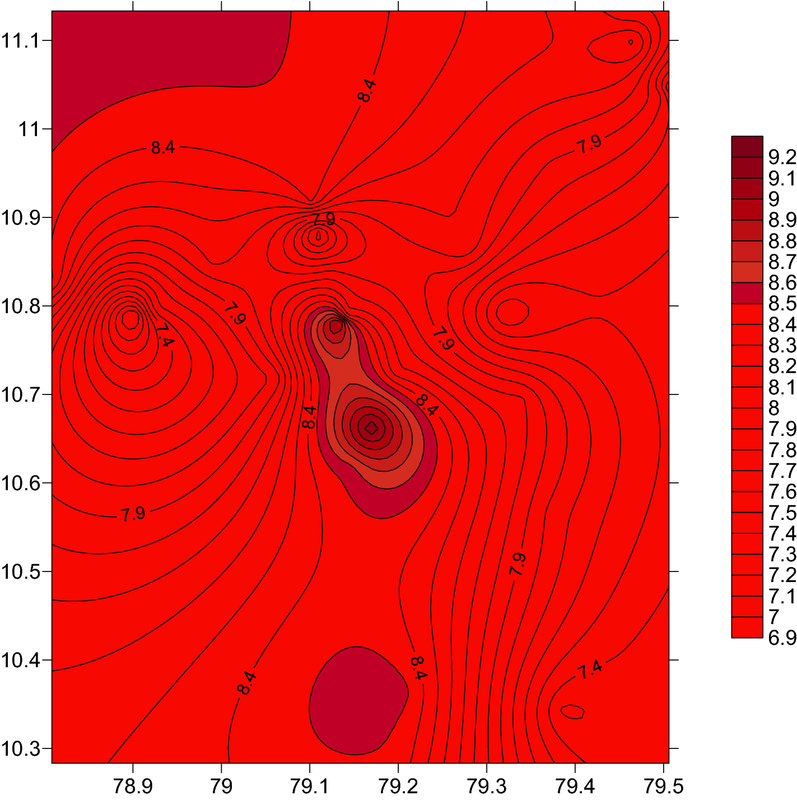 Figure 3 shows the piper trilinear plot for groundwater samples. The majority of the samples fall into the mixed Ca–Mg–Cl type, Ca–HCO3 type and lastly Na–Cl types. The presence of the Ca–Mg–Cl type shows the mixing of fresh groundwater with anthropogenically affected water. Langelier saturation index is developed by Langelier  to evaluate the effect of calcium carbonate (CaCO3) in the water distribution systems and industries. This is the major reason for corrosiveness of the water. This index represents the corrosive or coating behavior of the groundwater samples. The amount of free CO2 in excess amount and its chemical behavior with Ca and Mg are the most important causes for the corrosive nature of the water [31, 32]. The dynamics of carbonate and the presence of CO2 are controlled mainly by the pH values of water. Acidic water is more prominent to corrosion. The values of LI usually vary between − 3 and + 3, and the negative values represent the undersaturated water with corroding tendency. 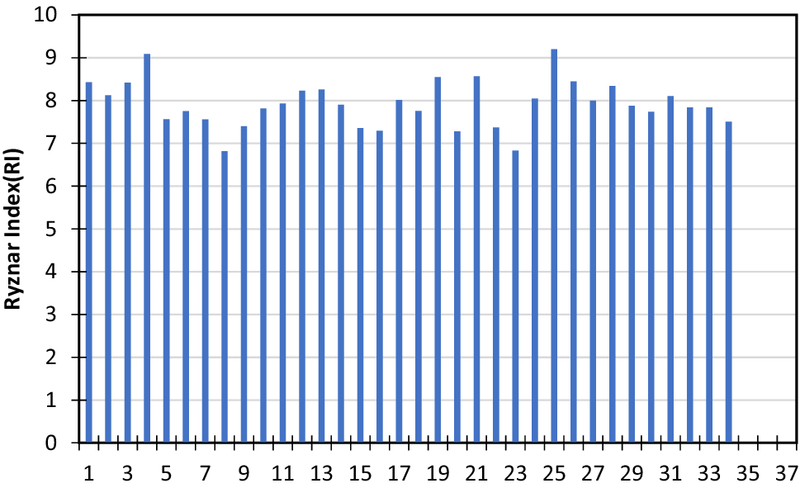 In this study, LI values vary from − 0.5505 to 0.8405 with an average 0.1298 (Fig. 4). Fourteen out of 34 (41%) samples have LI values less than zero and thus have corrosive nature. On the other hand, all the remaining samples (59%) have LI values exceeding zero and thus samples are supersaturated with scaling tendency. Figure 5 shows that negative values were found in central and southwest region of the study area. However, eastern and western region of the study area has positive LI values showing the scaling nature of the water. The average LI values are positive, so mostly water was saturated and has scaling capacity. AI is a parameter of water corrosiveness which is often used as an alternative method for LI. It depends on the pH, total alkalinity and calcium hardness . The major advantage of this index is that the calculation does not need the temperature and TDS values and thus it is simpler than LI. On the other hand, AI is less accurate than LI, so it is considered as a general indicator other than a quantitative measurement. 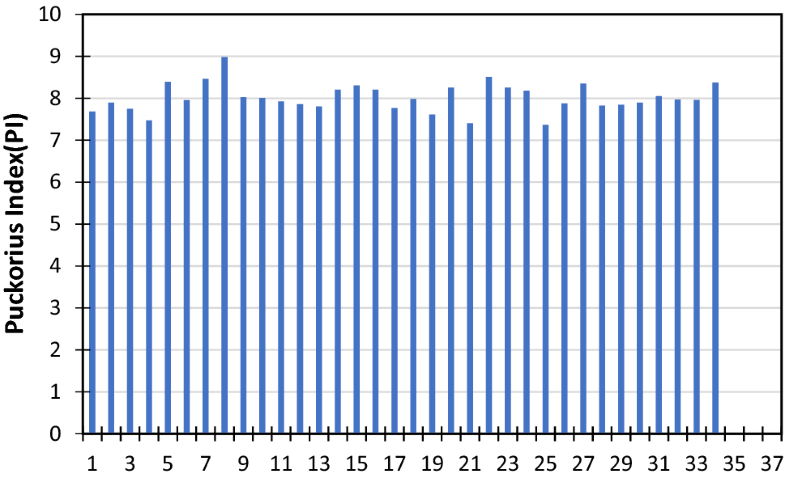 In this study, the AI values ranged from 11.33 to 12.83 with an average of 12.09. Figure 6 shows the AI values of individual water samples in the study area. All the samples have AI values less than 10, thus not coming under highly aggressive. 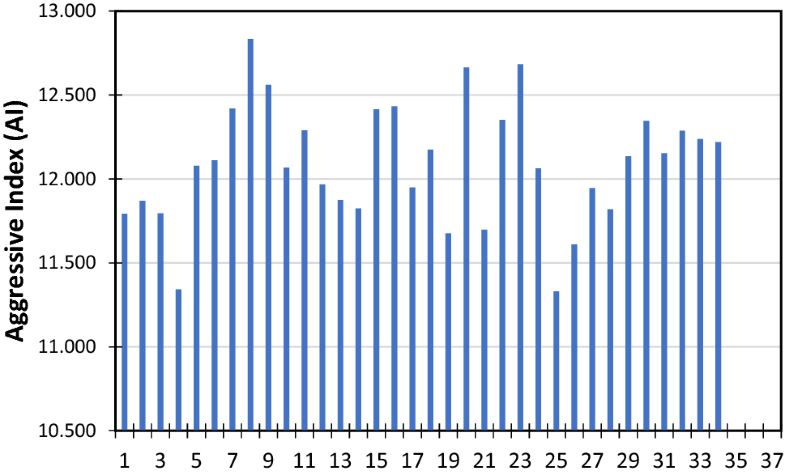 AI values of the fourteen samples (41%) ranged between 10 and 12, showing moderate corrosiveness. The remaining 20 samples have AI > 12, indicating the scaling nature with very less corrosivity. The AI values showed the same trend of LI, and water in the central part has scaling tendency, whereas eastern, western and southeastern regions have moderate corrosivity (Fig. 7). A modified version of LI was proposed by Ryznar , based on pH and pHs values of water and successfully proved improvement over the LI. The results better quantified the scaling properties of water in numerical value. The interpretation of the different classes of RI values is presented in Table 3. 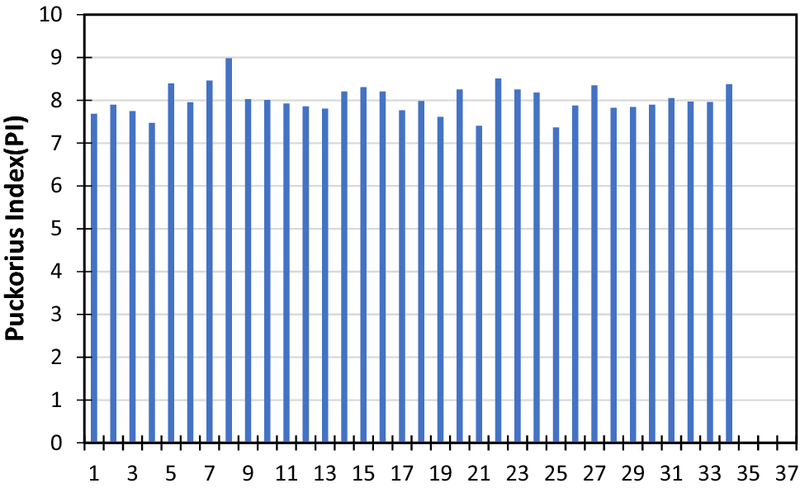 In this study, the RI values ranged from 6.81 to 9.20 with an average value of 7.92. Figure 8 shows the RI values of the groundwater samples in the study area. Results show that 30 out of 34 samples have RI values ranging from 6.8 < RI < 8.5; thus, water was characterized as having corrosive tendency. Remaining 12% of the samples have RI ≥ 8.5, meaning that the water has rigorously corrosive tendency. The results of RI also agree with the above-discussed index and show the same pattern (Fig. 9). PI is derived from the value of pH and alkalinity of water. The method of calculation is explained in Table 1 and the interpretation in Table 3. 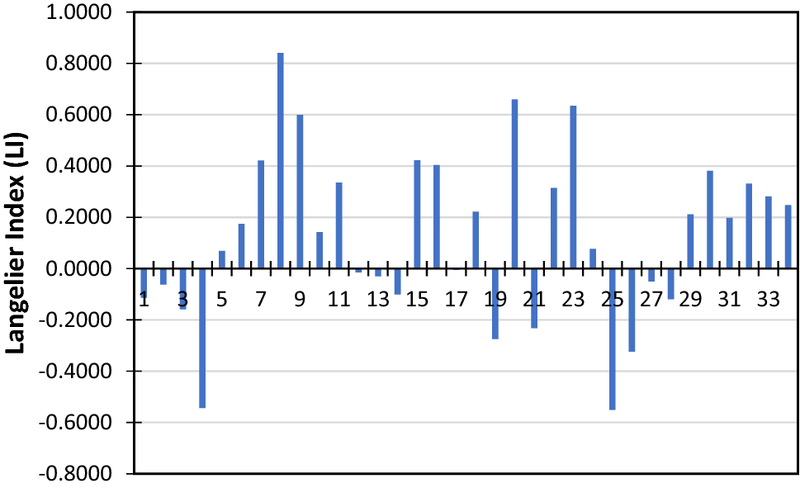 This value represents the buffering capacity and the precipitation characteristics of water samples to reach equilibrium [32, 35]. In this index, the equilibrium pH is used instead of actual pH of the water. The general classification of PI can be classified as PI < 6; 6 ≤ PI ≤ 7; PI > 7, less corrosive, little corrosive and scaling tendencies and significant scaling tendencies, respectively. The PI of the present study varied from 7.37 to 8.99 with an average of 8.02. 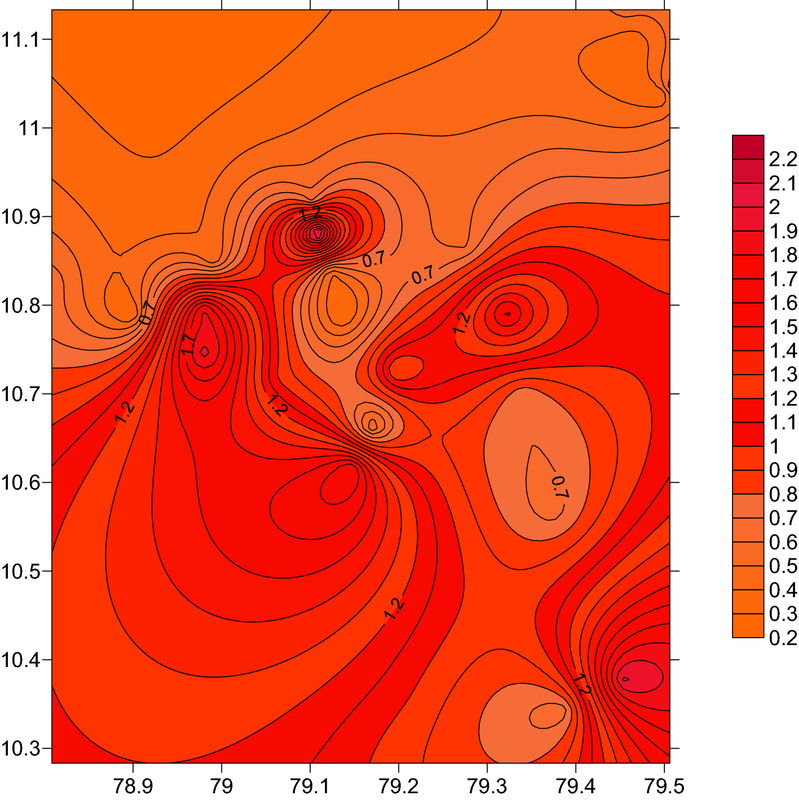 All the samples were having PI > 7, suggesting that water has considerable scaling tendency (Fig. 10). The higher scaling tendency in the groundwater is observed in the western and southeastern region of the study area (Fig. 11). This index is suggested by Larson and Skold  based on the hydrochemical parameters such as chlorides, sulfates, carbonate alkalinity and bicarbonate alkalinity. Their experiments revealed interesting results like alkalinity reduction, whereas sulfate and chloride increased the corrosivity. LS index of the groundwater in Thanjavur district varied from 0.27 to 5.15 with an average of 1.08 (Fig. 12). Twenty-one samples have LS < 0.8, suggesting that the water has scaling tendency. Four samples were with 0.8 ≤ LS B 1.2, indicating the higher corrosion rates. Nine samples exceeded the LS > 1.2, showing the high rate of localized corrosion. The spatial variation of the LS suggests that water with high corroding tendency is distributed mainly in the central, eastern, western and southeastern regions, which agrees with result of the other indexes (Fig. 13). Groundwater quality and its corrosive-scaling tendencies were assessed for the Thanjavur district in Tamil Nadu. 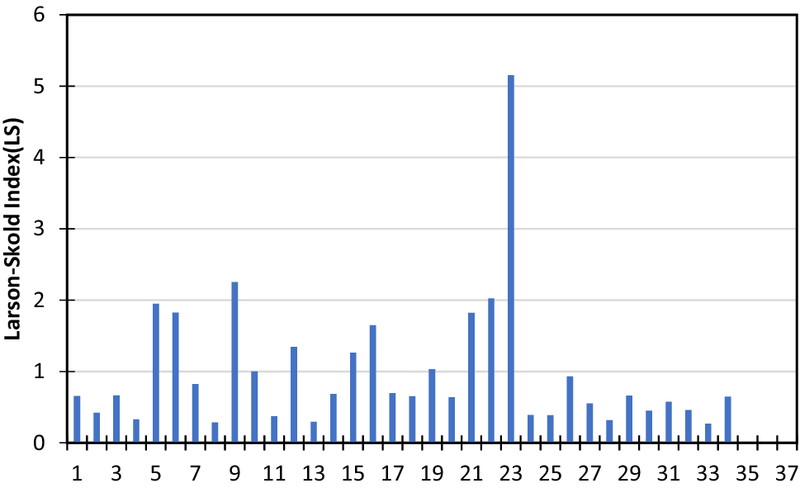 The order of dominance of cations was Na > Mg > Ca > K, and that of anions was HCO3 > Cl > SO4 > CO3 > NO3 > F. TDS values suggest that six out of 34 samples exceeded the permissible limit of WHO standards. Majority of the samples were Ca–Mg–Cl type of hydrogeochemical facies, suggesting the mixing of natural groundwater with possible anthropogenically impacted groundwater samples. The corrosion and scaling indexes were assessed with five most commonly used indexes. LI and AI indexes commonly suggested that 41% of the samples have corrosive tendency and the rest of the samples have scaling tendency. RI and PI suggest that entire samples have corrosive tendency. LS values also suggest that 62% of the samples having scaling tendency and the remaining 38% of the samples have corrosion tendency. Application of multiple indexes has proved to give more accurate information on the corrosive or scaling tendency. Spatial variation mapping of the indexes shows that the central region of the Thanjavur district is having more corrosion tendency, whereas western, eastern and southeastern regions have more scaling tendencies.